In January 2016, B2N launched a two-year Ontario research program with Simcoe County District School Board and Dr. Andrea Faber Taylor, University of Illinois, to investigate the outcome of regular time learning outdoors at school on students, educators and families. 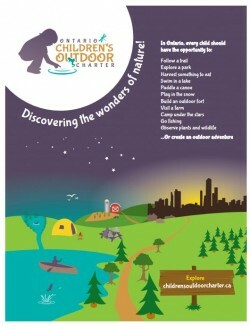 Simcoe County District School Board is a leader in promoting outdoor learning at all its elementary schools, and Dr. Faber Taylor has produced internationally-recognized work on the impacts of nature exposure to children’s health, including the influence of time in nature on children with ADHD. This research will investigate the impacts of regular outdoor learning time at school for kindergarten students. Results from the research, the first of its kind in Canada, will provide a framework for educators to better understand the influence of the learning environment on student success, and could generate a model for other Canadian schools. Funding for the research program is generously provided by TD Friends of the Environment Foundation. Read the full news story in this Toronto Star article. B2N is partnered with the Ontario College of Family Physicians on a project to deliver an education module for health professionals on the benefits of nature to human health. Read the full news story in this Toronto Star article. In partnership with the Children and Nature Network, B2N is working to support a large, diverse and broadly skilled community of organizations by providing webinar training and access to Network Weaving tools. These tools will assist Network Members by allowing them to share lessons, resources, and inspirations around our shared mission to connect children and families with nature.